Although dark matter is a successful theory in cosmology, with lots of evidence to support it, the model does have a few weak points. One of these concerns dwarf galaxies. For example, dark matter models predict that a galaxy like the Milky Way should have more dwarf galaxies orbiting them than we see. But recently we’ve started to discover more dwarf galaxies near the Milky Way. Now a new paper in the Astrophysical Journal presents the discovery of several more. The work used data from the Dark Energy Survey, which is scanning the sky in the southern hemisphere, gathering data to study dark energy. But one nice thing about these sky surveys is that the data can be used for other purposes as well, and the authors of this paper did just that. Going through the data they found nine faint cluster objects. They could confirm three of them as dwarf galaxies. The other six could be dwarf galaxies, but could also be large globular clusters. What’s interesting about these objects is that they are all in a similar direction of the sky, in the region of the Magellanic clouds. That would seem to indicate that similar dark dwarf galaxies could be waiting in other areas of the sky. These particular dwarf galaxies are quite dim, which is why they haven’t been discovered before now. It’s only through deep sky surveys like the DES that such objects can be found. These galaxies may owe their dimness to dark matter, but at this point we can’t be sure. 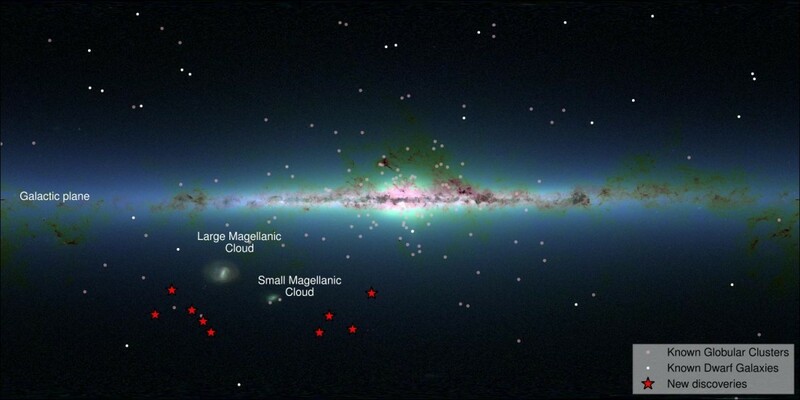 But if other areas around the Milky Way have similar faint dwarfs, it may answer a nagging mystery about dark matter.